Philippa Taylor was first female in the Barney Memorial 5k and the Thorney 5. Athletes from Nene Valley Harriers dominated the Barney Memorial 5k at Ferry Meadows, winning the men’s and ladies races and comfortably taking both team prizes. The race, held every year in memory of former Nene Valley favourite Mike Barnsdale, was staged on a new, slightly more demanding course and fast times were not expected. Perfect weather and the fine form of the leading local runners proved the predictions wrong, however, as many scorched to new personal best (PB) times. 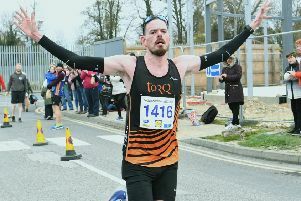 Nene Valley star Lloyd Kempson was first over the line in a time of 15:43, just three seconds ahead of runner-up Anthony Johnson of Werrington Joggers. Third place went to Nene Valley’s Joe Turner with a PB of 15:54, which represented a massive improvement for the former Gateshead Harrier. Another Nene Valley athlete, Rhys Goddard, was just behind in fourth place with 15:57, knocking two seconds off his previous fastest time. Nene Valley Harriers possess their strongest squad of female distance runners for many years and they filled the first four places, all with PBs. The quartet of Philippa Taylor, Cat Foley, Tracy McCartney and Grace Mullins set off together, with Taylor aware that she would have to be at her very best to avoid a rare defeat by a team-mate. The Stamford-based 48 year-old is a determined racer, and she pulled clear at the halfway stage as the group splintered. Despite a late challenge from the fast finishing Foley, she held on to win in a time of 17:44, a one second improvement on her previous fastest time over the distance set at Lincoln earlier this year. Foley came home just three seconds later, bettering her previous best by two seconds. with Tracy McCartney holding off the challenge of Mullins to take third place with a time of 18:20. McCartney finished five seconds ahead of a rejuvenated Mullins, who has made a fine return from injury in recent months. Stamford Strider Maggie Skinner also came home in under 19 minutes, finishing 5th in 18:47.